Hey guys!! If you follow me on either Facebook or Twitter, you would have seen a little sneak peak photo of this look! 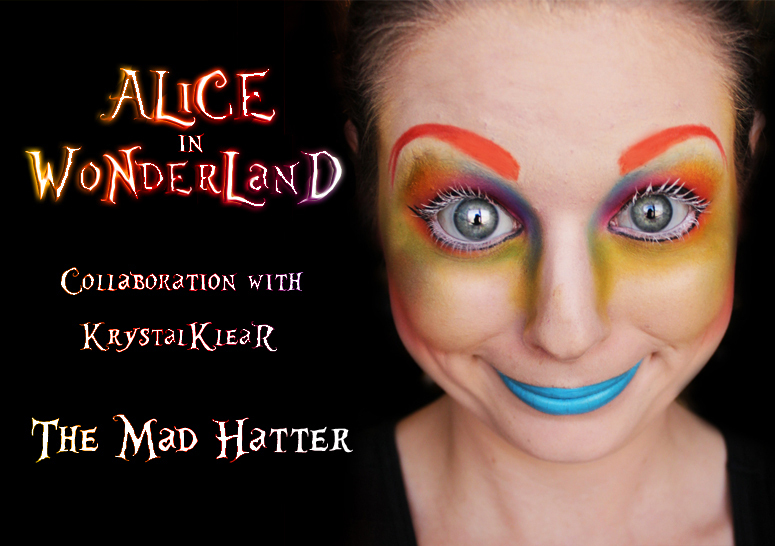 I did a YouTube collaboration with Tasha from KrystalKlear! We both did our own versions of The Mad Hatter. You can see her version here :D I am sooo excited to finally show you guys this!! I hope you guys like it!! I felt like a clown all day! it came out amazing ! GEEEZ!! This is brilliant! The brows, the eye makeup...everything's gorgeous. This is great! You certainly look mad as a hatter. it is really pretty! I need to get over my fear for bright lipsticks so I can wear that everyday! wow! :D what contact lenses are you using? OMG! That looks fabulous and kind of scary. haha hilarious and so cool at the same time! the mad hatter is the best to recreate, and you did a great job! the face was also like the mad hatter! I've been thinking bout doing him myself! So cool, I love the white lashes! Wow, this is so awesome! You did such an amazing job!